Scores of multi-site companies have benefited from deploying ServiceChannel’s facilities management platform across their organizations. While we’ve seen successes from retailers of every type, restaurant chains, convenience store chains, financial services establishments, supermarkets, etc., there are both common threads and unique aspects with each of our clients. When speaking to companies seeking to address the challenges they may be facing, we’ve found that sharing with them similar challenges from other like companies and the results attained, helps them get a sense of the type of actual benefits they could gain themselves. Whether it’s issues with contractor sourcing, work order management, data visibility, business intelligence or quality of service, our clients have lots of stories that we believe others can learn from. Specifically, they wanted store managers to be able to easily enter and track work orders online, and own the contractor sourcing process themselves. After careful evaluation, the retailer deployed ServiceChannel’s SaaS based solution and contractor directory. With increased visibility across the service request – contractor chain, the retailer gained improved efficiencies, costs savings and greater resource utilization. 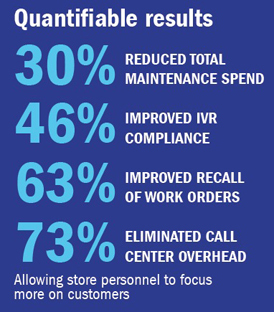 Total maintenance spend was reduced by twice the original goal with no negative impact on store operations. A key result was a 30% reduction in total maintenance spend. The retailer’s now measuring and tracking true vendor performance in real time and the facilities team is providing stores with improved service and newfound access to critical operating data. 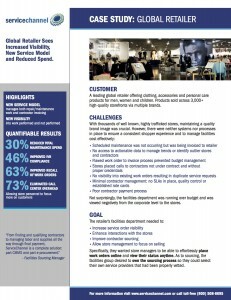 To learn more details on the benefits and quantifiable results this retailer achieved, please download our case study here. We look forward to sharing more customer successes with you. Have you optimized the visibility into your retail operation?